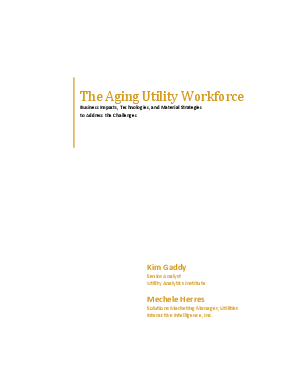 The utility industry's workforce is aging and this poses a huge risk in the coming years. Experience, understanding and know-how built up over decades resides with employees who've worked at a single utility that company for most or their entire career. These employees are human knowledge banks, and when they leave, their loss leaves a gaping hole known as "brain drain." Utilities everywhere face the same issue - many have failed to recruit new talent to replace their aging workforce. Approximately 60 % of the utility industry workforce across the globe is over the age of 40 and many will retire in the next 10-15 years. The struggling economy delayed the number of employee departures projected. The facts are that these departures will happen – and that is around the corner. How will utilities tackle and address this challenge? This timely webinar focuses on multiple facets of the people, process, policy and technology implications of the coming changes.